My friend and I were hired to do a doljabi in September in the theme of macrame and succulents! 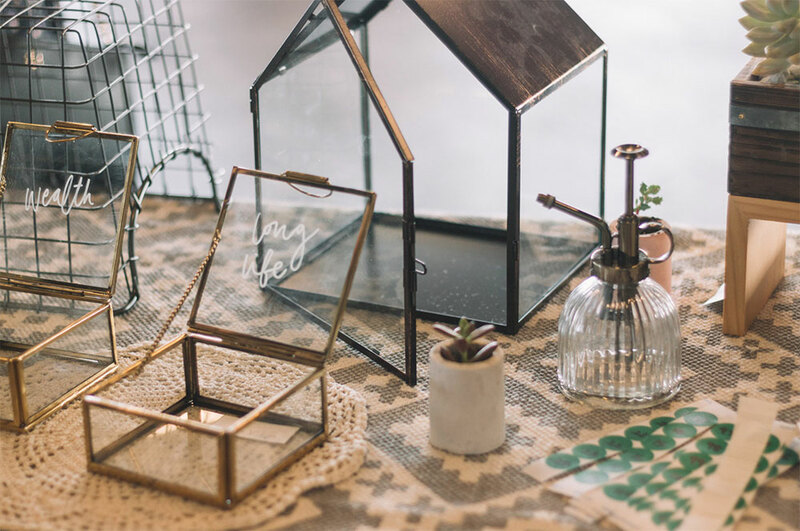 This was another fun event for us especially since we love working with textiles and greenery. Like the first event, I created a moodboard before purchasing and creating items. It’s important that I do this so our client can see our plans and can comment on what they like and don’t like. I would keep editing the moodboard until they love it! After they approve the moodboard, I get started on creating and collecting the necessary items. Then a week or 2 before the event I’ll let our client know what’s been happening and let them know every detail of items I have (forks, number of cake stands, etc) just so we’re prepared. 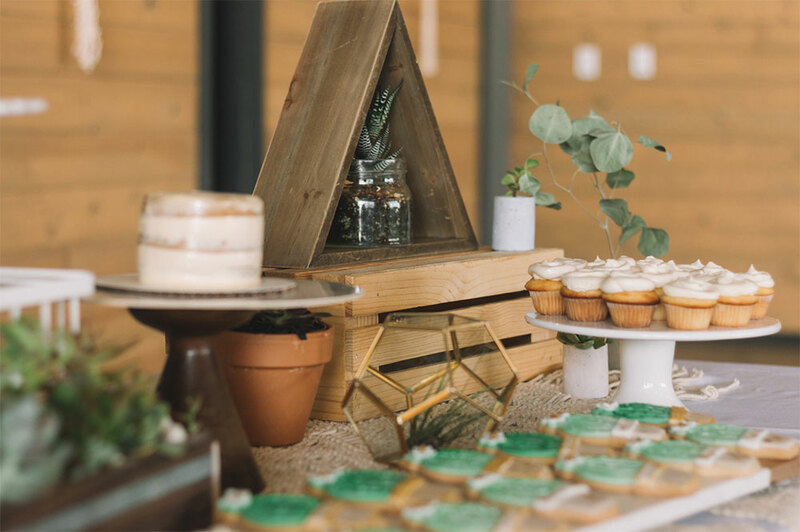 For this event, I used faux eucalyptus and some succulents on the cakes. This really helped the cake pop and be a part of the dessert table. They also had a taco cart and a churro truck! I loved decorating for this event even thru the heat. It was difficult for us to do the activities since the balloons would pop because it was sooo hot. But still a great event! 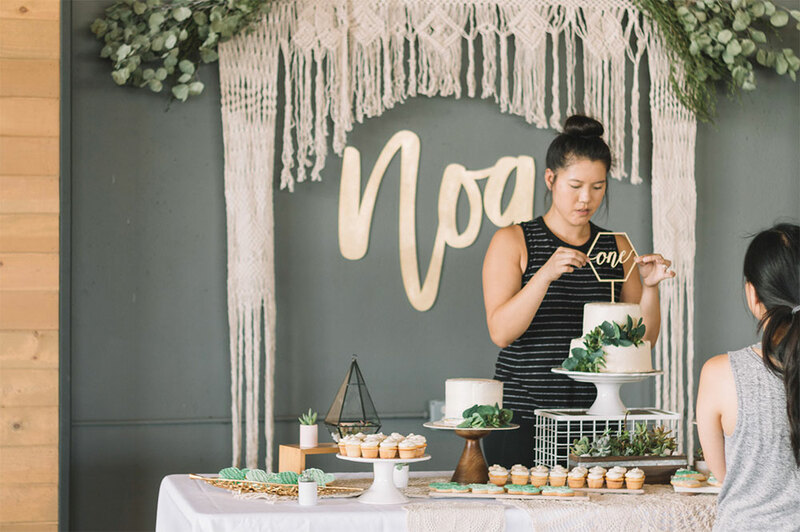 I am excited to share photos of a first birthday party I helped decorate along with the help of my friends Kirstie, Tiffany L, and Tiffany I! The baby girls' name is Beatrix and the party was based off her favorite song, Mountain Rabbit. 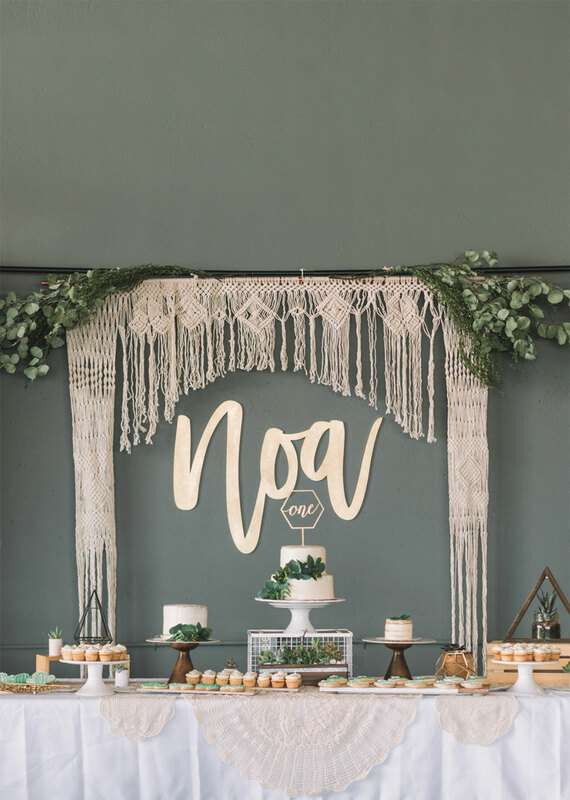 It was fun coming up with the concept for how the backdrop, welcome table, and seating decorations would go. 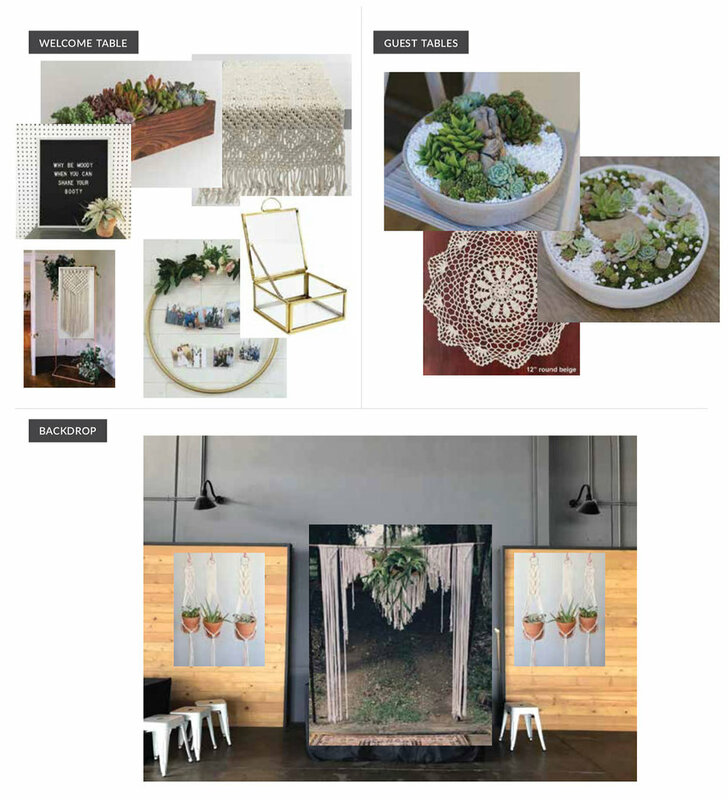 Here's the mood board I came up with and had her approve before I started gathering and creating the necessary items. For the most part I'm happy with how everything turned out. There are things I would've liked to add and some other things to improve but I'm so happy to have the opportunity to create a party like this. Amazing photos from the event taken by Susie Bakonis. Our dining set is almost complete! We're still finding the perfect bench to go opposite of our gray chairs. We're leaning towards making one but I just haven't found the time to do that yet. BUT OK! let's just admire the structure of these chairs. I found them just sitting around church (eh eh did you catch that pun?) and asked if I can have them since they weren't being used. With some trusty spray paint and new fabric, I knew this chair would look chic. SO OK...I used fabric that was just lying around my house and that are NOT the best. But HEY I still dig it and am liking the wrinkles. We're still waiting for our hymn books to arrive to place them under the chair. Silly right? But a detail that I'm looking forward to. Flowers are pretty wonderful and I'm starting to enjoy these delicacies - real and fake. I got to design the invites and decorate a floral baby shower this past weekend. Their theme color was purple so my team and I made purple paper flowers for the shower. I also used eucalyptus and flowers from the Alhambra's farmer's market. I got 3 bunches for $12...AMAZING. I was very excited and I plan to reuse the eucalyptus to decorate our home for Christmas. My friend planned the baby shower for a fellow nurse so the games she created were centered around medical things. So how funny is this game?! Pin the sperm on the egg. Cleverrrrr. Ladders have become a really popular object in homes. Have you noticed? I can see why...it added a lot of character to our living area and I love it! I used mahogany wood and copper pipes from Home Depot. Then I cut the pipes, drilled holes into the wood, sanded the wood, and lastly glued the pipes into the holes. TA DA! Wasn't that fun? It's another year of dressing up for Halloween! I didn't dress up in Jr. High or High School and it's been quite fun to dress up with my coworkers for the past couple of years. This year we bought masks from Wintercroft and then spray painted them gold. We're the casts from Jungle Book with a daft punk style. Can you guess all the animals? For the second part of the Mushroom Party, we made wildlife mushroom boxes! I got some flat moss from Michaels and cut and laid them out as the base for each box. These are the same boxes I used for this gift. I also pre made the little mushrooms using dry clay so my guests can paint it themselves. We then glued various moss on top of the flat moss, added some coffee beans as rocks and that was it!